Amaryllis has a new ball design -- she has 30 PANELS in this cool fabric shape!!!!! 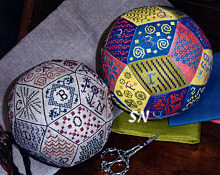 It is a puzzle ball -- the type of shapes making up the shape are officially called a rhombic triacontahedron!!! You are stitching letters of the alphabet and nine numerals and a few diamonds of personalization, along with small motifs in Cross Stitch, Smyrna and Chain Stitch -- all on one cut of fabric. Denise had piece layout diagrams in here for 28, 32 and 40ct fabric options -- this is facinating!!!!! You'll stitch it all, cut them apart, assemble and stuff and then destroy anyone who wants to throw it across the room like a ball!!!! Get the pattern, then decide on your fabric option -- this is a cool design. For you geometry wizards, the circumference runs between 19 and 21 inches depending on fabric count. You can figure out the diameter of the finished piece! (I had a crush on a guy in geometry class in high school -- I didn't learn enough in that class to help me with this challenge later in my life. Like WHO KNEW I would need that valuable information NOW!!!) Presented in chart format, there are wonderful diagrams in here, as well as finishing pictures. Here is a cute EMBROIDERY design -- not Cross-Stitch -- just simple straight and primitive stitches with DMC floss. Offered as line drawings, you'll need to trace them onto plain dish towels or pillow cases. 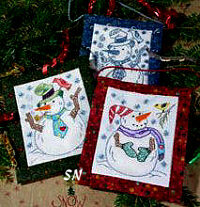 Then, stitch over the lines with Backstitches and French Knots -- in whatever colors you want! There are even instructions to 'color them' with crayons!!! Presented as 3-1/2 x 4 designs, you can enlarge them in a copier before you trace them if you want. Just something fun and old-fashioned to get out and work on when the weather is cold and snowy outside! 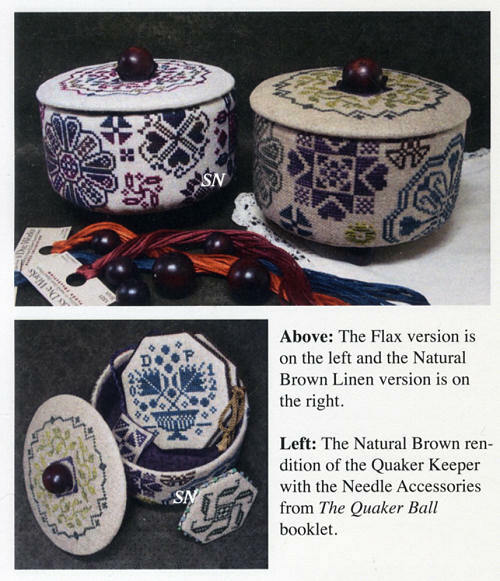 This is a fun little round 'box' that is decorated with Quaker motifs. 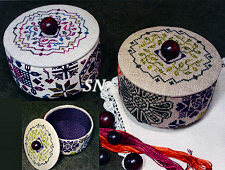 It features a lift-off lid, and can be worked on anything from 32 to 40ct linen, or even 16 or 18ct Aida. Choose a pretty hand-dyed thread so you aren't making a lot of color changes and work up the quick stitching. I was kind of mortified to tell you that this is finished over an empty 12 oz tuna fish can, until I found out that a very Treasured Stitcher Friend of Denise's used to decorate tuna cans with lovely embroidery to sell for charity! Denise designed this piece with memories of her friend in mind! Certainly a creative finishing treatment -- she has presented excellent assembly instructions with good diagrams... do you remember the little worm that drives around in his tuna-fish-can convertible from the Richard Scary children's books??? Quaker Keeper is offered as a chart. Wow... here's a neat Puzzle Ball to showcase some special buttons you might have in your Grandmother's treasured button box! Stitched on bits of three different shades of brown linen -- 32ct -- using blacks, browns, hazelnuts and creamy colored threads, pearly buttons just pop out amidst the designs. You could always switch linen and thread colors if your particular buttons like something else instead! Actually quite generous in size -- the diameter is about 5 inches. You are stitching eight hexagons and six squares (about 25 to 40 stitches each in size) and each one features a different design -- making your ball especially fun to look at from all sides. Lots of good assembly instructions, diagrams and pics included in the chart. I've been studying this design... and finally succumbed to its charm! 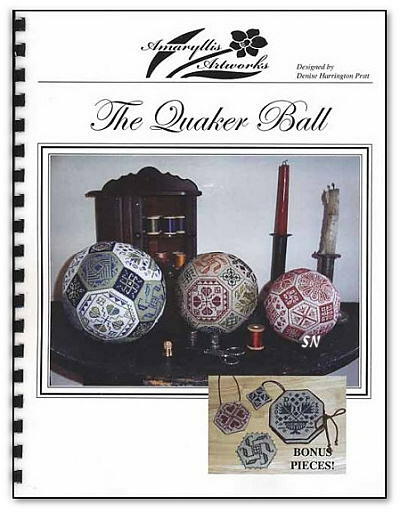 It is a collection of 26 Quaker motifs -- each stitched individually -- that are joined into a geometric shape -- a Puzzle Ball! Make your ball tiny or larger, depending on the linen count you choose... and vary the fabric and thread colors as you wish. (You can see lots of variations in the picture!) The 30-page book includes the charts for each of the pieces... a little bit of geometry education... and then lots of great instructions and steps to help you assemble your linen ball. Ordinarily, a geometric shape like this has flat sides, but our linen (when it is plumped with stuffing) turns into a round ball! The largest version in the pic is approx 6 inches in diameter, the smallest is on 40ct and it is approx 4 inches. Nothing hard on the stitching end... the finishing is actually quite basic as well.. but your finished product will ENCHANT! Offered as a booklet, get it first and study your linen and thread options.